This time, Link lives in a huge floating island known as Skyloft, Zelda is no longer a princess, and the controls are based on Wii Motion Plus gestures. Out-of-bounds Bird Statues, chests, and more! 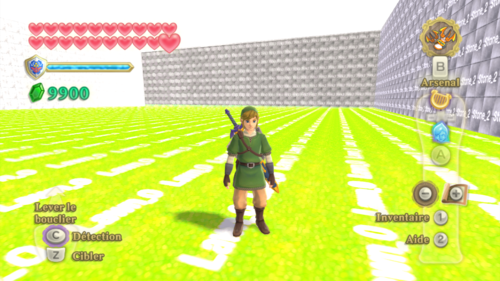 This unused area is accessible by using the Action Replay/Gecko codes for "Moonjump" and "Levitation". By starting at Lanayru Desert (Zone: Temple of Time) (F300_4) and using moonjump to bypass the cliff to go into Lanayru Desert, you will stay in F300_4 but be placed in an early version of Lanayru Desert. Alternately, this same area can be accessed by using "Back in Time" glitches, as can be seen in this video. A wall behind the bird statue is visible, which does not appear in the used Lanayru Desert map, as the Timeshift Stone isn't present. 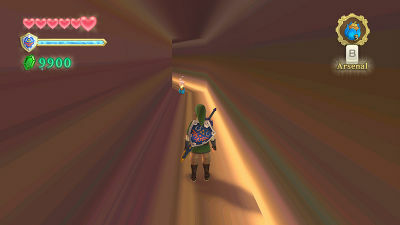 This strange corridor is located between Lanayru Desert & Temple of Time (F300 and F300_4). This area can also be accessed using moonjump. This room contains an actors setup (13) which enables the end credits of the game. The file that contains the actors setup is "Demo_stg_l13.arc.LZ". "F405" which is used to the first cutscene of The Imprisoned has the same collision as "Demo". Make codes for the other regions. Groose has a punching bag with a drawing of Link's face on it. In the game, that drawing depicts homely Link, with casual clothing (right). This texture is found in Stage\F001\F001r_stg_l0.arc\oarc\DecoC.arc\g3d\model.brres (punching bag's model). However, in Stage\F001\F001r_stg_l0.arc\g3d\stage.brres (general Academy textures) there's an unused texture for a punching bag drawing depicting Link with his uniform's hood on (left). It's unlikely the drawing was meant to change mid-story. A placeholder drawing was probably made first, featuring the character they had at the time — uniform Link — until it was later changed to homely Link, to fit with the actual storyline. An aliased version of Groose's painting's texture, seen on the left, exists in Stage\F001\F001r_stg_l0.arc\oarc\Paint.arc\g3d\model.brres (files regarding paintings). It looks a bit worse than the one on the right. The latter is in the same file, and it's called tanen for some reason, but there's another copy of the first one in Stage\F001\F001r_stg_l0.arc\g3d\stage.brres, the file with almost all other Academy textures. It's likely that the one on the right is the one that's used, but that is yet to be confirmed. A model of a disc, probably belonging to the harp platform in the Tower of Light, exists in Stage\F000\F000_stg_l4.arc\oarc\SwitchHarp.arc\g3d\model.brres. Its texture is half of the Triforce symbol, with "TEST" written on the side. Found in Stage\F000\F000_stg_l15.arc\oarc\Demo05_01.arc\g3d\model.brres\Textures\BirdEgg, this texture has 仮(kari), or "temporary", written on it. The Imprisoned's scales use a small texture with the text "SAMPLE TEXT" in Stage\F000\F000_stg_l21.arc\oarc\Demo03_02.arc\g3d\model.brres. Gaebora's naked model (that luckily ends by the waist), has a really tiny dummy texture in the "eyes" category. Amidst Beedle's Airshop's textures, in Stage\F002r\F002r_stg_l0.arc\g3d\stage.brres is this one, named col_tree. The texture only has the Japanese word for tree, 木(ki), written on it. 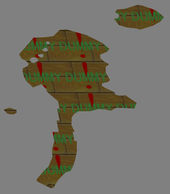 "DummyWater", found in Skyloft's textures, in Stage\F000\F000_stg_l0.arc\g3d\stage.brres\Textures. These textures are visible on a 3D model of Skyloft Lake. Found inside Stage\F001\F001_stg_l0.arc\g3d\stage.brres\Textures is this small blue texture with what seems to be an arrow. Talk about the Black Stone and upload a picture. Karane has animations for when she's being blown by the Gust Bellows. You can't use items indoors, and she's only outdoors before you obtain that item. Rip the animation, take a video, or take a screenshot. In the final battle with Ghirahim, and with the use of hacks, the player can battle Ghirahim on the spiral area in the Sealed Grounds. Hanging on an edge will cause Ghirahim to begin an animation in which he shrugs and proceeds to step on Link's hands, causing him to fall. The E3 demo had the options in the file selection screen replaced with options for each of the three modes featured in the demo. Text for it remains in the final version, translated in all available languages. On a related note, said demo has the entire text from the final version, along with the full soundtrack. Well, here's 9 900 rupees. You've pretty much cleared me out! This was supposed to be said by the Thunder Dragon when you defeat 13 bosses. However, there are only 12 bosses on the Boss Rush mode. There's apparently more. For example, the codenames for Scervo and Dreadfuse were inexplicably changed for the North American release according to Zelda Wiki. 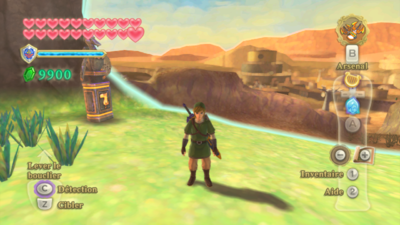 Unlike in The Wind Waker, all of the (minor) voice acting remains the same as in the Japanese version. 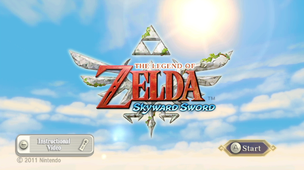 The Japanese text is also centered, like it has always been the case since Ocarina of Time (but not in the GBA games). It scrolls considerably faster than in the localized versions, as seen in some speedruns. Also, some text differences can be found. It is unknown why this change was made. 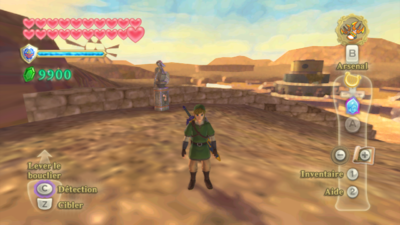 The presence of a run-on sentence in the North American release suggests it may be the version written first, with the text cleaned up by the European localizers. You got the Goddess' Harp! But now is not the time to give it a close examination! You got the Goddess' Harp! But there's no time to admire it! ...Technically there is time to admire it, just not now. It's possible that both of these differences are due to translators interpreting the original Japanese differently. In this case, it would seem that the European translation is more literal than the North American version.